The Omega NC800 HDS 5th Generation Nutrition Center Juicer is the latest Omega HD Model with design improvements over the previous popular 8003, 8004, 8005, 8006 models. The Omega NC800 HDS juicer has all the same features as the Omega 8000 series juicers, but with new improved features. So Whats New With The NC800 HDS ? There are a few advantages to the newly designed Omega NC800 HDS model . The most important change improvement are the 5 adjustable settings added for maximum juice output, with a longer screen at the end compared to the 8003, 8004, 8005, 8006 models. The NC800 HD Model provides an estimated gain of 10%-15% improved juicing yield (approximate -Fruit type varies) when juicing than the earlier models. The pulp remaining is extremely dry , which means the NC800 is far more efficient during the squeezing process over the 8003, 8004, 8005, 8006 models. This can vary depending on what fruit/vegetable you are processing. This can help save time, fruit/vegetable quantity required going into the machine, some cost savings, and cleanup time. The design improvements on the NC-800 HDS help optimize the performance when squeezing hard type fruit and veggies, like a carrot or apple for example. The Omega Nutrition Center efficiently juices fruits and vegetables. It will even juice citrus fruits, usually one of the hardest fruits to juice. In addition, it will juice vegetables like carrots, beets, celery, peppers, and radishes without destroying the natural flavor and nutritional benefits. Fresh taste and full nutrition are guaranteed with this unique extraction process. Wheatgrass, kale, collards, chard, cabbage, spinach, and pine tree needles are just some of the natural products that can be juiced with the Omega Nutrition Centers. Enjoy the best that nature offers in raw foods of all kinds and juice them for full nutritional benefits. The Omega Nutrition Center chops and minces, improving natural flavor and nutrition from garlic, scallions, red pepper, ginger and most other foods, including herbs and seasonings. Soft foods for special diets (i.e. babies and geriatric patients) are quick and easy to prepare with the mincing set-up. 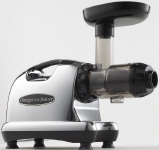 These Omega series juicers will also allow you to make pasta. You simply make the pasta dough, and let the machine extrude the pasta-like shapes. Make fresh frozen desserts, natural baby food and nut butters using your fresh ingredients. Tip: Try peeling some ripe bananas, freezing in a zip lock bag, and then put it through the juicer with its blank screen. NEW More Durable Auger – GE’s ULTEM material results in an auger is 8 times stronger than others. Two juicing screens for firm and soft produce. the Omega 8006 and Omega nc900?